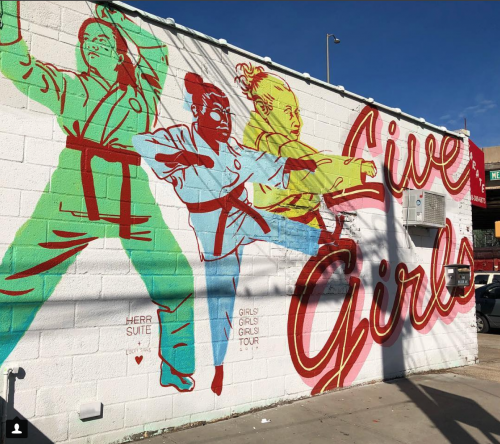 Boost your confidence and sense of security by attending this class to learn essential self-defense skills. Prepare to sweat and move, and whether you’re a beginner, or have experience, come work it out! 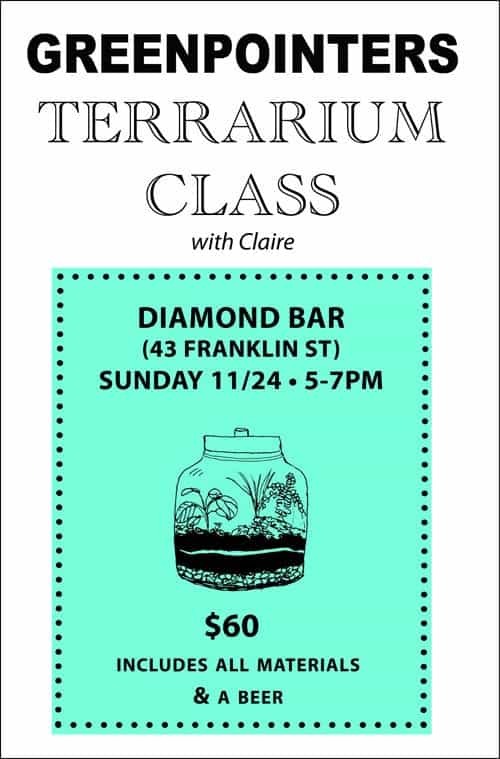 Join us for a Fall Terrarium Class with Claire at The Diamond (43 Franklin St) on Sunday 11/24/13 at 5pm. Make a gorgeous Woodland Plants Terrarium in a beautiful glass bowl to warm up your home during the winter months. They also make great gifts. Terrariums require very little maintenance which makes them perfect house plants for busy bees. All materials are provided plus a complimentary beer! Hurry – tickets sell out quickly. 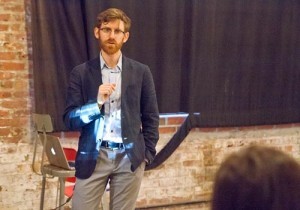 Recently, I took an amazing Public Speaking Workshop with a fantastic teacher named Andrew Linderman and got so much out of the experience that I want to offer the class to Greenpointers readers. If you want to communicate more confidently and convincingly, perhaps to make a presentation at work or to tell a great story in an effective way, then take this class! I promise that you will leave this workshop a better public speaker and you will learn a lot about yourself and maybe make some new friends. It was really a lot of fun, too! Need to feel confident speaking in front of group of strangers? Come across as more genuine and less robotic? Want to finally overcome your fear of public speaking?!? In this 3-hour workshop, participants will get expert coaching and feedback on ways to strengthen their presentation skills, from techniques to calm frayed nerves to exercises designed to build confidence and improve focus. 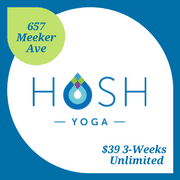 The class is limited to 16 people, so participants are guaranteed lots of time to practice and plenty of instructor feedback. Everyone will leave this workshop with experience speaking in front of a group and valuable insight into how to be a powerful communicator. Preparation: If you have something short (1-2 mins) that you’d like to work on, bring it in! Otherwise we can generate some content in class. Andrew Linderman has a B.S. from the University of California, Berkeley. 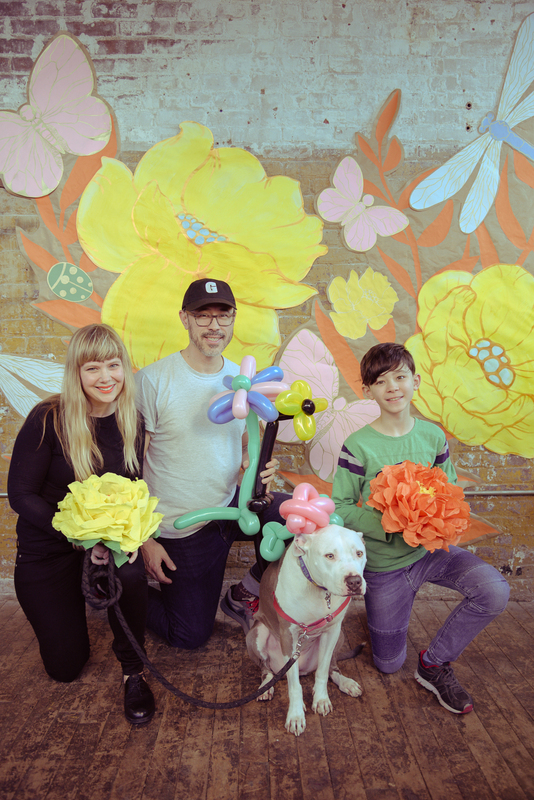 Andrew currently teaches storytelling with the Brooklyn Brainery and The Moth, and is the executive producer of Local Stories, a monthly storytelling series featuring writers, comedians and performers from all over New York City. Prior to his work as a storyteller, Andrew trained as an actor and improvisor at the Upright Citizens Brigade and the Atlantic Theater Company in New York City. Andrew has also worked as a city planner, a radio DJ and an economist and has lots of stories to tell. Don’t be jealous of your friends who have green thumbs and gardens; brighten up your apartment with a gorgeous green thriving world! 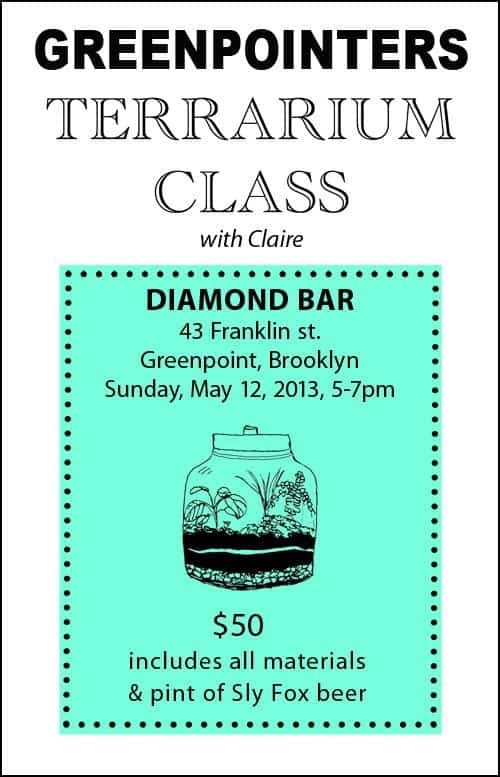 Come make a terrarium and drink beer at Diamond Bar (43 Franklin St) on Sunday May 12, 2013 from 5-7pm, with Claire. All supplies are included, plus a beer. For $50, come empty handed and leave with a beautifully made-by-you terrarium filled with ferns, decorative stones, pretty moss, and enjoy a complimentary Sly Fox! The terrarium I made over a year ago, thanks to Claire is still thriving and I have somehow managed to keep my evil cat from destroying it! I am very proud of it and know you will enjoy yours for a long time, too. Are you like me, so short everything even cropped pants need to get tailored? My first mistake is wearing cropped pants! 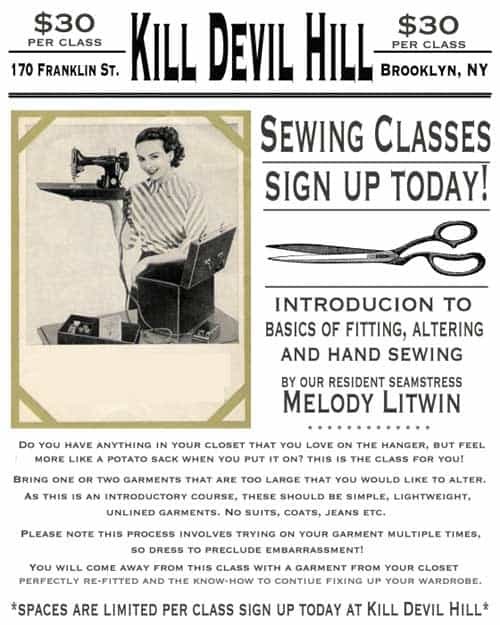 But this isn’t a fashion lesson it’s a sewing lesson from the resident seamstress Melody over at Kill Devil Hill. 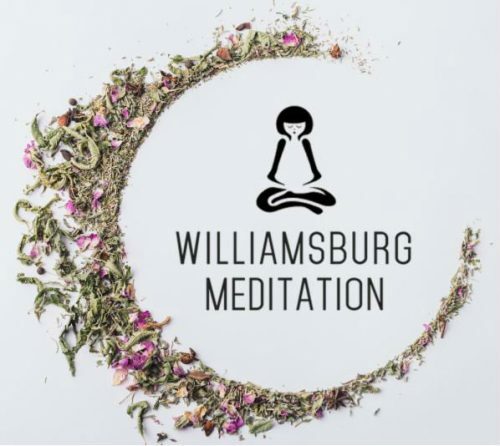 The class is $30, but $5 off for Greenpointers’ readers! Just mention us when you sign up! Knife Forging/Engraving – Sat. 8/18 @Smorgasburg – FREE! 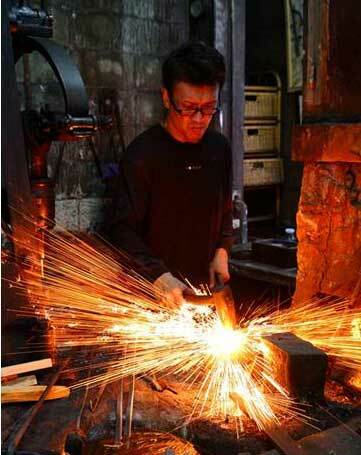 Three Japanese master craftsmen from Kikuichi Knives will be at Smorgasburg (27 N. 6th St.) this Saturday 8/18/12 from 11am-3pm demonstrating how to make knives from iron to blade as part of The Brooklyn Kitchen’s ‘Kitchen Island’ summer series. Kikuichi Knives has been making knives for over a hundred years, but before that they were making Samurai swords that bore the Emperor’s Chrysanthemum symbol as a mark of their excellence. This event is Free and there will be tastes of Japanese beer, sake and sushi from Chef Kaz Limori. Intensati @ [email protected] Tonight! Elina has been raving about Intensati for the past two years and said that one of her goals was to teach it. So I did what I do best, plantonic and professional matchmaking (I don’t touch the romantic stuff). 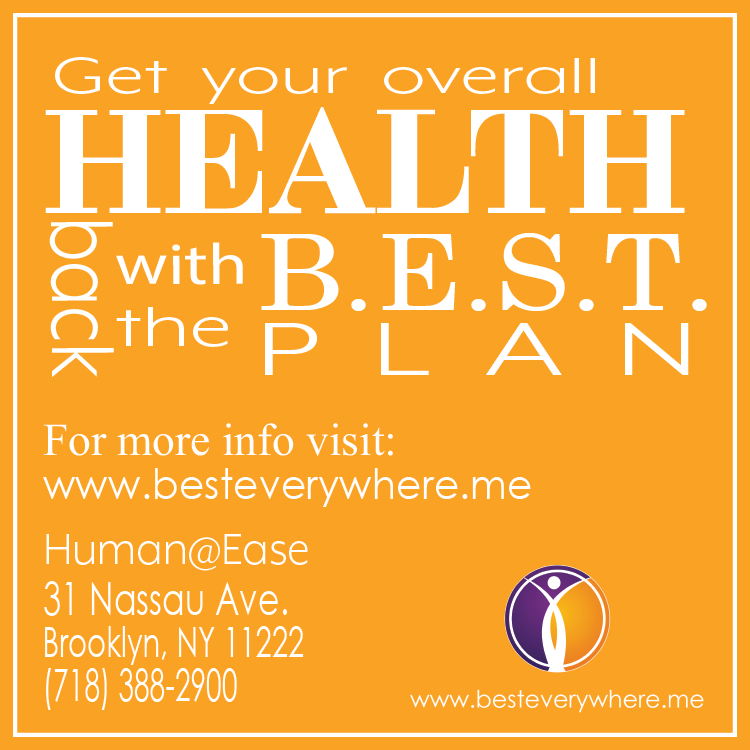 I introduced Elina to Dishan, owner and trainer/life coach at [email protected], where I work out weekly. I knew that if I put these two ladies together, their boat would sail off into fitness/self-improvement heaven. I am so proud and happy that Elina is in Greenpoint, doing what she does best, which in her professional life is enabling people to discover and pursue their dreams through a company called Dream Careers, Inc. Now time it’s for Elina’s dream to come true and share the benefits of fitness and wellness with you. 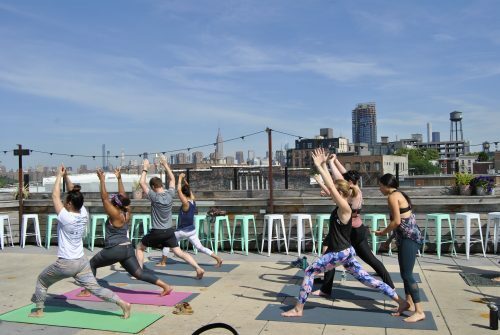 Join IntenSati with Elina tonight at 8pm, which promises “you will leave class feeling stronger, uplifted and inspired.” For $10, that is a steal! Join Greenpointers for a Rice Balls Class & Supper with Jen on Monday April 23rd, 2012 at 7pm at Paulie Gee’s (60 Greenpoint Ave). Learn how to make homemade arancini, which means little oranges, a delicious, traditional Sicilian specialty. After we fry up all the rice balls we can sit down and eat them all. Includes wine. Course includes all food and materials. (Vegetarian Friendly.) This is going to be ALOT of fun! Limited seating. Reserve by making a payment via paypal. Our last terrarium class was a blast. Sign up quickly for this one because it will sell out fast! $40 includes all materials and a pint of beer. There are a few spots left for this Wednesday’s Chutney Class at Good Yoga (73 Calyer St). Click here for more info.